Generally speaking, I only mention City of Edinburgh Council to moan about the many things they are doing wrong (or not doing at all!). Perhaps it’s a little too easy to lose sight of the fact that the council is investing the highest proportion of its transport budget of any authority in the UK (currently 6%) in cycling. So yes, while a bit of help from citizen snowploughs has occasionally been called for, it would be churlish to deny the major step forward that we’ve seen compared with previous winters. 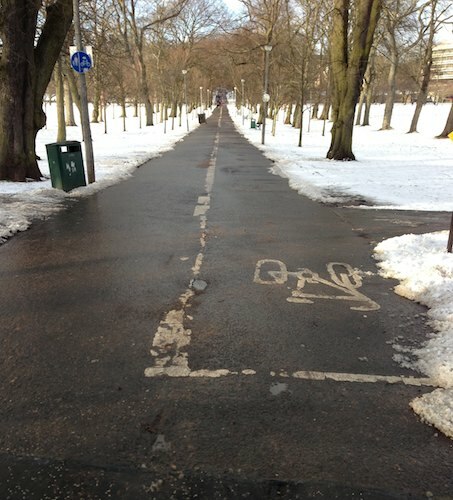 At least when it comes to uncontroversial measures that don’t disadvantage the sacred motoring cow, it’s reassuring to see some improvements on the ground; gritted paths are enjoyed by thousands of residents.